Aberdeen-based, metal reprocessor, steel trading and environmental services company, John Lawrie Group, has revealed that high commodity prices in the first half of 2008 has resulted in it reporting record profits for 2008. The latest accounts lodged by the internationally active firm with Companies House show group operating profits of £6.2m, and turnover for the year ended 31 Dec ember 2008 rose 47% to reach £119m. Significant reinvestment in new fixed assets continued last year, particularly in plant to support decommissioning and dismantling projects for the oil & gas industry. “This service has grown over the last few years, and we are well positioned with facilities at Invergordon and Montrose, as well as Aberdeen, to continue to meet the needs of operators and service companies,” added Mr Parker. An additional 4.5 acre site in Aberdeen has been acquired in 2009 which will be used to support existing operations and allow for further planned expansion, including the provision of a new and long awaited NORM waste decontamination facility. Mr Parker added, “The steel tubulars business continues to flourish internationally. Over the last four years we have seen significant growth in activity in our oilfield tubulars division in the US. Although the North American market has been quieter over the last six months, we are seeing resurgence in the Far East for some of our products. 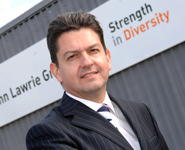 The John Lawrie Group has developed an enviable reputation for quality customer service since it was established in Aberdeen in the 1930’s as a scrap metal merchant. It is one of the country’s leading privately owned companies and has operations throughout the UK and in USA, Europe, the Middle East, and China, employing a 100 strong workforce.